Allin L. Rhodes, from the book "Los Angeles from the Mountains to the Sea" By John Steven McGroarty, published in 1921. Allin L. Rhodes known for his many conspicuous interests in financial affairs, is a true son of the Golden West, a native of Calaveras County and representative of a family that has been in California seventy years. His father, the late Alonzo Rhodes, was born at Lumberton, North Carolina, May 25, 1825, and the Rhodes family is still a prominent one in the Old North State. Alonzo, however, spent his early manhood in Tennessee and Mississippi until in 1849 he joined the argonauts to California, making the trip overland. He fanned in San Joaquin County until 1856, mined in Calaveras County until 1872, and from that year until he retired in 1891 was occupied with real estate and conveyancing in Stockton, where he is best remembered in a business�way. In 1886 he and associates took over the street railway system of Stockton, and during his connection therewith it was greatly improved and extended, with service adequate to that growing and progressive city. Alonzo Rhodes moved to Los Angeles in 1899, and spent the last five years of his life here. He died in May, 1904. He was a member of the Society of California Pioneers. At Stockton March 15, 1855, he married Miss Anna MacVicar, a native of Mississippi, and of their six children three are living, Alonzo Willard of Los Angeles, and Mary A. who lives with her brother Allin. 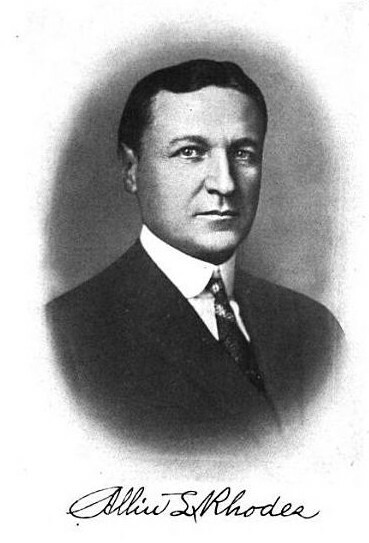 During his boyhood and youth in Stockton, Allin L. Rhodes attended the public schools, but took his professional education in the University of Michigan, where he was graduated in the law course with the degree LL.B. After his admission to the bar he practiced at Stockton until a break down in health in 1897 compelled him to abandon his profession there. After two years of recuperation among the Sierras with refreshed energies he resumed his career at Los Angeles in the fall of 1899, and the following spring entered the legal department of the Title Abstract & Trust Company and about six months later took the general management of its affairs. In August, 1913 those in touch with Los Angeles business will recall the consolidation of this company with the Los Angeles Title Insurance Company, under the latter name, with Mr. Rhodes as general manager and director, the offices he holds today. In January, 1914 the company also absorbed the Los Angeles Title & Trust Company, giving it unrivaled facilities. The business of the company has assumed such proportions that it has recently, as shown by the reports issued by the Insurance Departments of the various States, been handling a greater volume of title business than any other company in America engaged in the title insurance business exclusively. Mr. Rhodes is also president of the Brearley Investment Company and a director of the Azuza Orange Company. He is a York Rite Mason and Shriner, a member of the Los Angeles Athletic Club, and in politics a democrat.